In the previous installment of this "Ark of the Covenant" series, we looked at the origins of the Ark and showed how it really symbolizes Jesus Christ. Today, we'll look at the Ark's history in the Bible. As the children of Israel wandered in the wilderness for 40 years, the Ark was carried before them on golden poles by the priests, following "the cloud of the Lord" in order "to seek out a resting place for them" (Numbers 10:33). 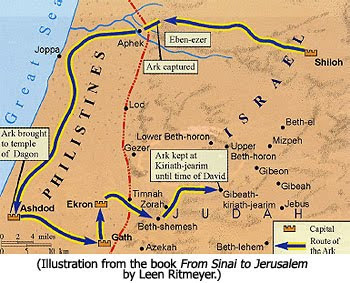 The Ark was carried into Canaan when the Israelites crossed the Jordan, and it was instrumental in their victory over Jericho (Joshua 6). During the 400 year period of the Judges, the Ark was housed in the Holy of Holies at the Tabernacle that was erected at the religious center of Shiloh (Judges 18:31 & 1 Samuel 1:3). During the latter part of the period of the Judges, when apostasy was rampant in Israel, the decision was made to carry the Ark into a battle against the Philistines as a good luck charm (1 Samuel 4:1-4). This desecration of the sacred Ark enraged the Lord, and He allowed the Philistines to win the battle and capture the Ark (1 Samuel 4:5-11). The Philistines took the Ark to Ashdod where they placed it in the Temple of Dagon. But the Ark proved to be a hot box for the Philistines. When all sorts of calamities began to afflict them, they decided to return the Ark (1 Samuel 5 & 6). It was first taken to Gath, but when the men of the city were afflicted with tumors, it was sent to Ekron where similar afflictions broke out. At that point it was loaded onto a cart pulled by two cows and pointed in the direction of Israel. The cows wandered about until they arrived at the village called Bethshemesh. When the people of that town ventured out of curiosity to look inside the Ark, a great number were struck dead (1 Samuel 6:19-21). They quickly decided to allow the Ark to continue its journey. 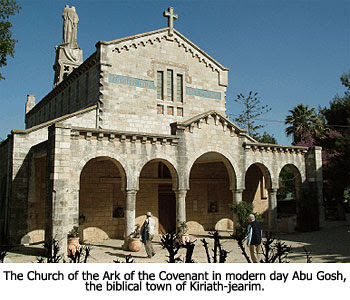 It ended up at the village of Kiriath-jearim, located just a few miles northwest of Jerusalem (1 Samuel 7:1-2). It remained there for almost 70 years in the house of Abinadab. (The 70 years were the last 20 years of Samuel's judgeship, the 40 years of Saul's kingship, and the first seven years of David's reign in Hebron, before he moved to Jerusalem). When David arrived in Jerusalem, the first priority of his administration was to provide the Ark a proper resting place because He was anxious to bring the symbol of the presence of God back into the life of the nation (Psalm 132: 1-5). The Ark's return was an occasion for great rejoicing (1 Chronicles 15:25-29). David placed it in a tent on Mount Moriah (today's Temple Mount) where it remained until his son Solomon built the Temple. The Holy of Holies in that Temple became the final resting place of the Ark (1 Kings 8 and 2 Chronicles 5). In the next installment of this series on the Ark of the Covenant, we'll look at the main theories as to where the Ark is today. personally, i can only think of two possibilities. the other theories are just that, theories. i wont mention the possibilities at this time. i dont wanna spoil it. The Ark of the Covenant(container of the law) is where ever Mosaic law is practiced. Jubilee each 7 and 49 years with a usury-free money system. As this is not practiced ANYWHERE the Ark is missing. Once we start obeying God's economic laws we will serve God rather than Mammon.